Requiescat in Pace Father Charles Patrick Moffatt, S.S.J. Father Charles Patrick Moffatt, S.S.J. 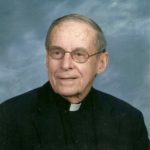 Josephite Father Charles Patrick Moffatt died at Stella Maris Nursing Home in Baltimore, MD on August 7. He had been a patient there for the last three months. He was 92 years old and a priest for 61 years. A proud native of Detroit, Michigan, he was born June 14, 1926, baptized in Nativity of Our Lord Catholic Church and educated in its parish school. Charles attended St. Anthony High School and University of Detroit, in the Motor City. He served seven months in Germany with the U.S. Army Infantry during World War II, as a Corporal and received an ETO, Rhineland Campaign medal. Upon completing college, Charles worked as an Investigator with the Detroit Welfare Dept. He entered St. Joseph’s Seminary in 1951 and was ordained to the priesthood in 1957. Fr. Moffatt’s first assigned as an assistant at St. Francis Xavier parish in Baltimore and two years later was sent as an assistant at Our Mother of Mercy Church in Beaumont, Texas where he served for five years. He was assigned to Epiphany Church in New Orleans for another two years when he was appointed to his first pastorate at St. Philip Church, also in the Crescent City. After overseeing the building of a new church at St. Philip’s following the destruction of Hurricane Betsy, Fr. Moffatt was assigned in 1968 as pastor of the only Josephite parish in his native Detroit at St. Benedict the Moor Catholic Church. In 1973 he was assigned back in New Orleans to St. Raymond Church where he administered the building of a new church, he left in 1981 for further studies at the University of Notre Dame. In 1982 he served one year at St. Joseph’s in Welch, LA, and then was assigned to an eight-year term as pastor at Our Mother of Mercy parish in Houston, TX. He was then assigned an eight-year term as pastor in 1991 to Most Pure Heart of Mary parish in Mobile, Alabama. Fr. Charles served in the vocation department, then in 2005 another four-year ministry as pastor of St. Luke Catholic Church in Washington, DC. Fr. Moffatt’s final active five years served as clergy fill-in, while residing at St. Francis of Assisi parish in Breaux Bridge, Louisiana. Failing health brought him to St. Joseph Manor in 2014. A Mass of Christian burial will be celebrated at St. Francis Xavier Catholic Church, 1501 Oliver Street, Baltimore, MD 21213, on Tuesday, August 14 at 11 a.m. with viewing beginning at 9 a.m. until Mass time. Burial will follow at New Cathedral Cemetery in Baltimore. Preceded in death were Fr. Moffatt’s parents Patrick and Christina, his sister Maureen (Bill) Mott and his brother Gerald Moffatt. Surviving are his sister Gertrude White, nephews Mark (Teri) White and Brian White, Peter (Carol) Mott, Kevin (Kathy) Mott, Bill (Nadine) Mott Jr., Tom (Pam) Mott, Michael (Jill) Mott and David (Heather) Mott. Also survived by his niece Kathleen (Ken) Mott-Crossman, 29 great nephews and nieces and several great -great nephews and nieces.